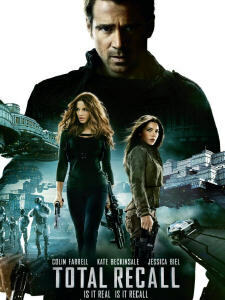 This year Kate Beckinsale out of the new Total Recall remake also appeared in the Contraband (2012) thriller. The wife of the director Len Wiseman is also the main star of the Underworld quadrilogy. He directed two first titles in the series, while producing both Underworld: Rise of the Lycans (2009) and Underworld: Awakening (2012). All the first three movies starred Kate Beckinsale alongside Bill Nighy, who also represented memorable characters in two films of the Pirates of the Caribbean (2003-2011) franchise and in the melodrama The Best Exotic Marigold Hotel (2012). The plot of the new film is one of its weaknesses. While the original movie harbored adventure, emotions and mysteries from Dutch master Paul Verhoeven also known for his violent RoboCop (1987), the remake is filled with Non-Stop action, where the characters are required for chasing, fighting and shooting each other. Being too serious the movie lacks a sense of humor, often making action titles better. At times the writers tried to bring the story closer to the literary source removing all the Mars scenes. Here in 2084 after the Third World War, which saw a wide use of chemical weapons, only two Earth territories are still viable for people: The United Federation of Britain (UFB) and The Colony located on the Australian mainland. UFB uses colonial populace as a workforce in the Total Recall film. Chancellor Vilos Cohaagen presented by Bryan Cranston, who voiced over Vitaly tiger in the animated sequel Madagascar 3: Europe’s Most Wanted, 2012) is struggling with the leader of the Resistance. His name is Matthias, who is played by Bill Nighy. The main protagonist Douglas Quaid performed by Colin Farrell is going to work every day through one huge underground elevator The Fall traveling alongside the Earth’s core. Humans are gradually replaced by many androids, which also serve in the local police force. Douglas lives with his beautiful wife Lori Quaid played by Kate Beckinsale. Doug is bored with his everyday duties, and at nights he is bothered by nightmares, where he sees himself as a spy escaping from the authorities with a girl named Melina. Actress Jessica Biel has fully showed their fighting qualities, while Kate Beckinsale became the second person on the list of villains after absorbing the whole role of Richter from the original film. Her part is one of the biggest lasting nearly till the credits. Eventually, Douglas visits the Total Rekall company to cleanse his memory, while accidentally getting back some knowledge about his double agent past life. While adventuring, Douglas will get a chance to visit the UFB capitol and even its surrounding wasteland hiding the HQ of the Resistance forces. Bob McClane selling memories is presented by John Cho, and Harry, who is one fake work friend of Douglas is shown by Bokeem Woodbine. Pretty soon, Douglas turns himself into a dangerous criminal hunted by all the local security forces. However, his excellent survival and combat skills can help him to evade the pursuers and get closer to the final goal in the Total Recall film, which is to save The Colony from the UFB invasion planning to destroy all its inhabitants. Read on further to learn about filming and the soundtrack of Total Recall.